If you thought fitting in beneficial breakfasts were tricky, how about getting a healthy lunch prepped and ready to take to work?! For many of us, that is not only a challenge, but we’re lost on WHAT to prep ahead of time and HOW to make it easy on ourselves to get out the door with enough fuel to make it home at night. This post of our Food Series is focused on healthy lunches, specifically lunches that are prepacked and ready to take with you to the office, the gym, or to the park with the grandkids. These are awesome options for lunch! We’ve personally used this method and fresh veggies really DO stay crisp and fresh all week long! Give it a try! If you’re watching carbs or want to pack in more whole grain nutrition without a lot of bulk, wraps are a great way to go! Try out these sensational options, wrap them in cellophane, and refrigerate for the week! Soup is just a great comfort food, isn’t it? It can be simple, or packed with flavor and nutrition! 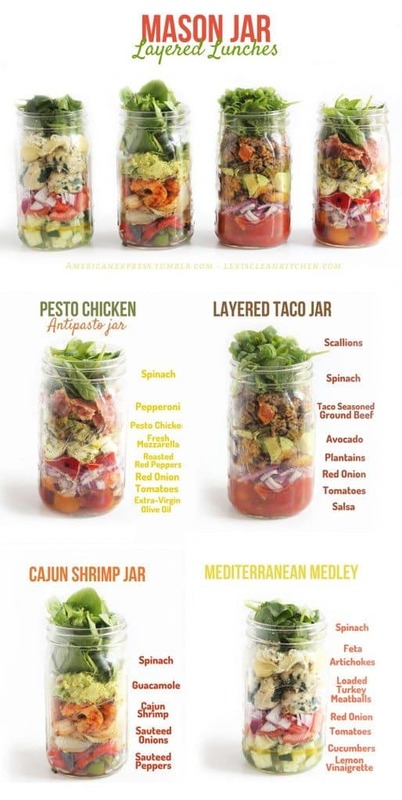 These are great options to make ahead in a crockpot, or put together for a healthy, DIY noodle cup in the office. What looks like it would be your favorite?